Before Serena, before Steffi, before Martina, there was one woman who changed women's tennis and paved the way for them all. Her name is Billie Jean King and her fight for equality revolutionized the sport forever. Unsurprisingly, she is now the subject of an inspiring Hollywood movie by Jonathan Dayton and Valerie Faris titled "Battle of the Sexes", chronicling a pivotal moment in her illustrious career. 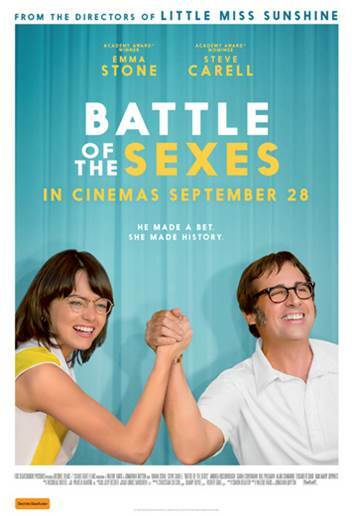 That titular Battle of the Sexes refers to an exhibition match that became a turning point for women in sport. It was played between King (Emma Stone) and a retired male pro Bobby Riggs (Steve Carell), who posed the challenge to assert male superiority. In the lead-up to the battle, King was at the top of her game. But she was frustrated by the lack of respect shown to the women's players. Despite their ever-increasing popularity, they were awarded only a fraction of the prize money of their male counterparts. Taking a stand, she joined with fellow players to form their own Women's Tennis Association with their best interests at heart. Meanwhile, an unhappy ex-pro named Bobby Riggs saw their efforts and decided to take advantage of their media visibility. So he decides to propose a challenge match to prove that even an out of shape 55-year old man could beat the best women's player in the world. King was initially reluctant however, perceiving it a fiasco designed to humiliate her and the entire sisterhood of athletes. But she later realized the golden opportunity it presented to prove the value of the women's game and promote equality. And the rest is history. Indeed, King's on-court achievements are well known. As with any biopic then, the challenge is to give deeper insight into the person. In that regard, Simon Beaufoy's script (a likely contender for Best Original Screenplay) mostly succeeds, delving intimately into King's personal life and public activism. And Beaufoy is commendably efficient in establishing King's character and the central conflict, setting things in motion with an early scene where King confronts the head of the US Lawn Tennis Association to put forth her case that women deserve equal prize money. Of course, the times weren't as progressive as they are now and she was rebuked. But we soon learn that King is nothing if not a fighter. The storyline soon reveals her leadership qualities in establishing the WTA, her fierce work ethic and as a married woman, her personal struggle to hide her secret lesbian affair. But even as she was evidently an icon of women's rights, LGBT rights and an ambassador for the sport, one of her most winning traits is her humility. And this humility is shared between both the character and Emma Stone in her portrayal of her. While the role is easily Stone's most transformative, the performance is completely naturalistic and devoid of actorly showmanship. Her effortless warmth therefore creates a rooting factor that serves the film well and will surely gain her fans in the Best Actress Oscar race. In contrast, Bobby Riggs is considerably less remarkable, which is no fault of Steve Carrell's enthusiastic performance. With the frequent reminders that he is a "self-proclaimed chauvinist" who is simply putting on a show, the script sometimes undermines the feminist intent of the film. Instead, his character is mainly just a moronic gambling addict craving the spotlight, making him a rather lame antagonist. As the film engagingly builds towards its triumphant conclusion, the imbalance between the characters becomes ever clear. I therefore agree with others who believe that the film would be more interesting as a more fulsome biopic focused more on Billie Jean King. Still, the film is a perfectly solid "down the line" play, to use tennis terminology. But perhaps more significantly, it's a striking reminder of how this Battle of the Sexes mirrored the recent US Presidential election. This social relevance will surely give the film some lasting power and will likely resonate with Academy voters. And with Billie Jean sure to join in on the film's awards campaign, the Best Picture has a proven champ in its midst.